Album Features His Best Moments At Toronto's Legendary Massey Hall From 1998 To 2001! 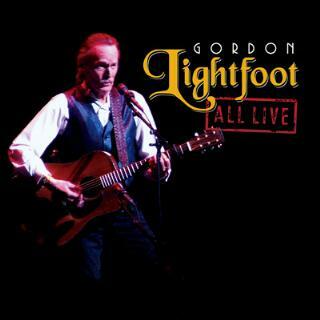 LOS ANGELES – Rhino is proud to announce the release of Gordon Lightfoot’s ALL LIVE. The album will be available April 24 at all physical and digital retail outlets for suggested list prices of $18.98 (CD) and $11.99 (download). On May 25, 2011, the Canadian music legend played his 150th concert at Toronto’s storied Massey Hall, a tradition he started 40 years ago. In 1978, Lightfoot played a remarkable ten shows in 9 days, selling out each and every night. Now, for the first time ever, Lightfoot has gone through the archives of live recordings from Massey Hall and has picked the finest performances recorded between 1998 and 2001 including such signature hits as “Sundown,” “Early Morning Rain,” “If You Could Read My Mind,” and “The Wreck Of The Edmund Fitzgerald.” “The recordings have not been technically altered and are authentic live mixes,” says Lightfoot of the album. Fans will hear each song exactly as it was performed that night – no over dubs, no mixing – ALL LIVE. Concurrent to the album release announcement, Gordon Lightfoot is announcing a run of tour dates in the Northeastern United States in May. The ten date tour is set to kick off in Westbury, NY on May 10. Full tour dates are listed below. On Thursday, June 14, 2012, Gordon Lightfoot legacy will be further enhanced when he will be inducted into the Songwriters Hall Of Fame in New York City in the performer category alongside Bob Seger, Don Schlitz, Harvey Schmidt, Tom Jones and Jim Steinman. For more information about ALL LIVE, please contact Jason Elzy in the Rhino Media Relations Department at jason.elzy@rhino.com or 818-238-6220.